For this week’s post I want to continue the sample solution. Even though I’m going to be as agile as possible we still need to have a rough idea of a roadmap and the best way to do that is with a dimensional model. Each business process we want to model is represented as a fact on columns. They are all to be stored at the transactional grain except possibly admissions. The conformed dimensions are listed on rows with the facts they are related to. How do we represent treatment outcomes? Is there a standard method? Can this be represented in a single dimension? What grain are admissions? Given the goal of calculating ‘bed days‘ we might need to model them as events in progress. I think we have enough to make a start and I don’t think we will deliver faster if we stop to resolve these issues first. Initially I’m going to concentrate on referrals, assessments and discharges since the number of patients in the system is one of the most useful metrics to monitor. This entry was posted in Sample Solution and tagged dimensional model, mental-health, mental-health-project on May 18, 2013 by jsnape. The previous couple of posts in this category haven’t exactly been exciting but they are important for context. Now things can concentrate more on the solution we are going to create. There are two main classes of business intelligence required – clinical and operational. The most important user stories are listed in italic text below. As a doctor I want to see treatment counts by patient and outcome so that I can determine the most effective treatments. As a doctor I want to see critical incident counts by patient and mental health professional. As an operational manager I want to see counts of assessments, treatments and discharges so I can plan capacity and monitor the number of patients in the system. As an operational manager I want monitor prescribing costs to budget effectively and look for unusual prescribing patterns. As an operational manager I want to see the number of bed days available and used so that I can monitor capacity and make sure suitable out of area options are available if needed. As an operational manager I want to see complaints by patient and mental health professional so I can make sure the service has a good customer focus. Finally, there are also IT requirements which must be satisfied but since they are not value-add for patients and doctors I’ll look into them later. This list is not exhaustive but the plan is to be agile – list the most important requirements, stack rank them and work down the list in iterations and re-plan often. Requirements will change, new ones will become apparent and some may even disappear before implementation starts. We will embrace this and not worry about the future too much. This entry was posted in Sample Solution and tagged mental-health, mental-health-project, requirements, user-story on April 10, 2013 by jsnape. I want to briefly wrap up the section on stakeholders specific to mental health services because this is where we will get our requirements from. At the top of the organisation is the chief executive and the trust board. Below her are the IT director, medical director, nursing director and three operational directors who are responsible for Child and Adolescent Mental Health Services (CAMHS), Adult Mental Health Services and Geriatric Mental Health Services respectively. The IT director is responsible for IT staff such as support staff and system administrators; IT systems and hardware; and IT projects. The medical director manages all the doctors in the organisation and the nursing director similarly the nursing staff. 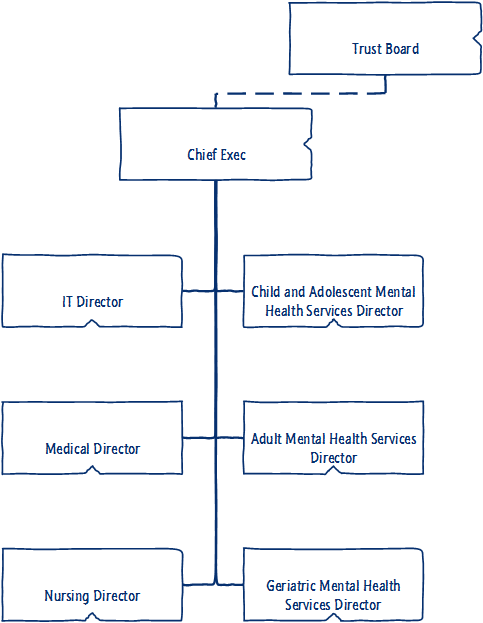 The operational directors focus on their individual services with a mix of staff including psychologists, counsellors, therapists, social workers and administration staff. The last three are generalisations – if this were reality I would be looking for specific people since the Interest/Power level is unique to a person and not the role. This entry was posted in Sample Solution and tagged mental-health, stakeholder, stakeholders on April 5, 2013 by jsnape. So this is the second attempt at writing this post. The first was very complete but read like a textbook and it makes more sense to read a real book – I recommend the stakeholder section in this book: Software Systems Architecture: Working With Stakeholders Using Viewpoints and Perspectives . All stakeholders have requirements, needs and interests which collectively I call “concerns”. I even track them in the same work item tracking system used for requirements since it means they never get lost and you can ensure traceability from concerns to requirements and architectural decisions. Acquirers may be wanting your software for a number of reasons. They might not actually use it so their concerns are likely to be related to cost, need and satisfying other concerns indirectly, for example purchasing reporting software because a regulator has demanded accurate reporting of patient outcomes with possible penalties for failure. In the mental health arena there are many additional “assessor” agencies and regulators such as the Care Quality Commission, Monitor, professional bodies such as the General Medical Council and watchdogs like Healthwatch. Fortunately they are mainly concerned with the quality of healthcare, patient outcomes and overall costs; less so about software. Administrators and support staff want to spend as little time, money and effort as possible with your solution so anything that eases deployment, automatically heals or diagnoses issues and keeps the software running will help. Its worth looking further though – what if an administrator has a review objective of reducing disk costs over the year and you turn up asking for terabytes of clustered storage? Their concerns should be easy to list and meet since they want the same things as you. In this sample project the only producer is me and anyone who supplies me with coffee. The remaining category are “communicators”. The book defines them as those who “…explain the system to other stakeholders…” but I think is should also include anyone who will discuss, promote, detract, educate, deny, network, rally and gossip about your project and are not in either of the other two groups. They may only by interested in your project for their own political reasons. Do you have stakeholders from all these categories? If so look at things from each stakeholder’s angle and try to imagine what their needs are. Then go talk to them and confirm it. This entry was posted in Solution Architecture and tagged mental-health, mental-health-project, stakeholder, stakeholders on March 23, 2013 by jsnape. 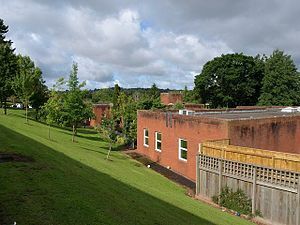 So its great that we know a little about how mental health services work but as an architect we need to cover some more ground before the project can be considered up and running. This post is about the slightly dirty subject of stakeholders and politics. Why do this? Well getting the politics right can mean the difference between a success and failure. All projects have stakeholders with specific concerns. Some can be ignored but in general it is the architect’s job satisfy those concerns. Some stakeholders have more power than others; they will also have varying levels of interest. The diagram below shows the best approach for each of the categories. Low Interest – Low Power: the easiest category to deal with since they are not too concerned with the project and don’t have the ability to derail you. Just monitor them for feedback and other information. High Interest – Low Power: this class of stakeholders want to know what is happening and still don’t have the ability to disrupt the project. The best tactic is to ensure they are well informed. Low Interest – High Power: these stakeholders can be the most difficult to deal with since they have the power to influence not only your project but many of the other stakeholders. The main issue being that they are not that interested so it is difficult to have meaningful discussions and negotiations. The primary tactic is to ensure their concerns are met with as little fuss as possible. High Interest – High Power: not only do they have the power to effect change but are interested in the outcomes. Personally I find this group a lot of fun since they can contribute to some very interactive sessions. The best tactic is to engage them which shouldn’t be too difficult given their level of interest. In the next post I’ll cover classes of stakeholder and why it some of the non-obvious ones might be the most important. This entry was posted in Sample Solution and tagged mental-health, mental-health-project, stakeholder, stakeholders on March 16, 2013 by jsnape.